Members of Fayetteville Christian Church have faithfully supported Christian City for more than 45 years. Volunteers from the church serve in many different roles across the campus. 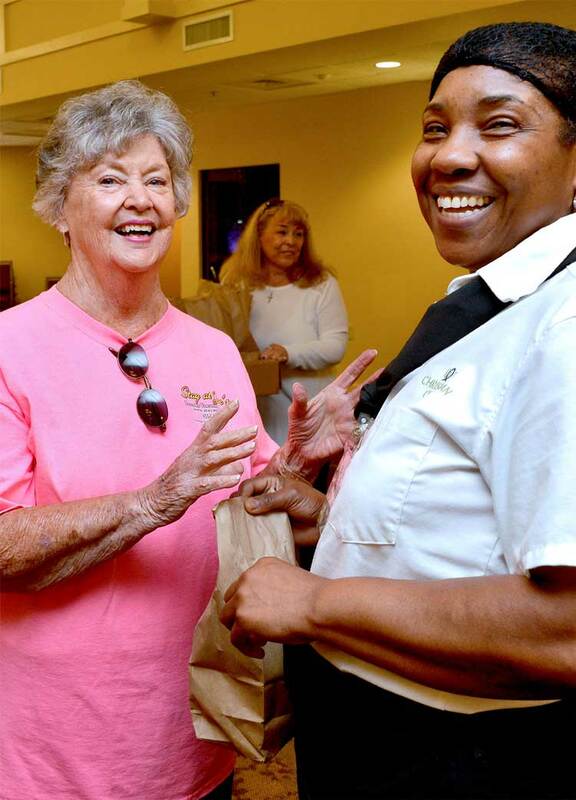 On April 25, the group shown above prepared and delivered brown-bag lunches for the staff of the assisted living center and skilled nursing and rehab center. From left: Fayette Christian Church members, Barbara Enright, Audrey Bates, Brian Enright, Christian City CEO Len Romano, Larry Etheridge, Linda Etheridge, Dean Laffan and Helen Thornton. Photo /Larry Regier. Others serve nursing home residents every day as a career. It’s their job to take care of those who are no longer able to take care of themselves. From therapists, nurses and CNAs to housekeeping and food service, a variety of staff members serves the needs of nursing home residents 24/7. Many say they have a passion for taking care of older people. Others say it’s their calling and they feel blessed to be a blessing. Selflessness is a common thread. Christian City Board of Trustees member, Audrey Bates (left) provides a lunch to Christian City dietary aide, Marie Regis. Photo/Larry Regier. Not everyone thinks of caring for the caregivers, but a volunteer team at Fayetteville Christian Church did. The team contacted the volunteer coordinator at Christian City senior care facility in Union City and made arrangements to provide a brown bag lunch with homemade chicken salad sandwiches to staff members on all three shifts at Christian City’s Assisted Living Center and Skilled Nursing and Rehabilitation Center. “We are overjoyed with the ongoing generosity of Fayetteville Christian Church,” said Connie Hall, volunteer coordinator at Christian City. “For the second year in a row, a volunteer team has shown their love for our staff by preparing and delivering lunch,” Hall says. As the volunteers distributed lunches to staff members, they enjoyed the opportunity to share their mutual appreciation for one another’s service. “It doesn’t take much to bring a smile to someone’s face,” said Helen Thornton, who has served as a church secretary at Fayetteville Christian for almost 40 years. Audrey Bates, Christian City board member emeritus, is the last original charter member of Fayetteville Christian Church, which was started in 1971 as the first Independent Christian Church in Fayette County. She served as music director for 22 years. “Christian City has been a part of my life since its beginning in 1965,” Bates said. She helped raise money to build the first children’s cottage and has also served as chairman of the board of trustees. Bates’s family has hosted Christian City children for weekend and holiday visits over the years as well. During this campus visit to serve lunch to the staff, Bates took the opportunity to visit her former neighbor in Christian City’s assisted living center. Several of their church members now live at Christian City in active senior patio homes and apartments, while others are in the skilled nursing and rehabilitation centers. Members of the church visit each Sunday to serve communion to the three members who are unable to come to church. Senior pastor of Fayetteville Christian, Andrew Higle, has volunteered his service as Chaplain of the Day at Christian City as well. Many members donate items to Graceland Thrift Store, where profits benefit Christian City Children’s Village education fund. Christian City is one of 18 missions supported by Fayetteville Christian Church. The missions team holds several fund raisers each year — a fish fry in May, yard sale in July, and barbecue in September. The ring leaders of the food-related volunteer efforts are Brian and Barbara Enright, members of Fayetteville Christian for the past 11 years. “We provide about 75 percent of the church’s specialty cooking,” says Barbara. Brian does the cooking and Barbara specializes in desserts. The couple had been out of church for 35 years before they were coaxed to attend Fayetteville Christian by Barbara’s mother in 2005. Now retired, the Enrights use their talents to prepare meals that convey their church’s love for its members and the community. Christian City staff and caregivers are often called “loving people, loving people.” On this day, the tables were turned. 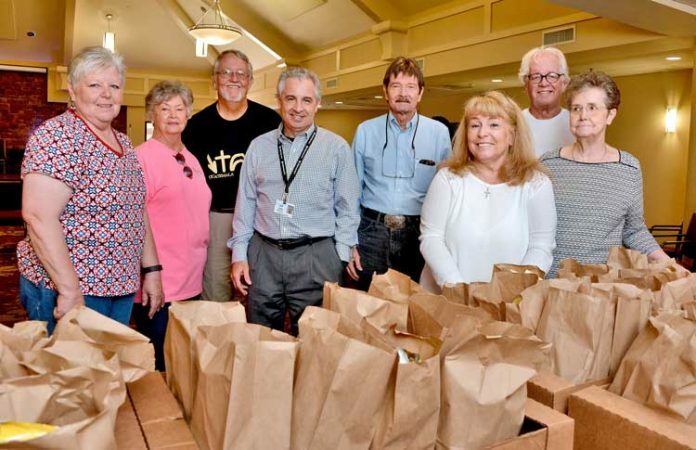 Fayetteville Christian Church fed the caregivers with good food and love through the selfless service of a delicious homemade lunch in a simple brown bag. For more info about Christian City, visit www.christiancity.org. For more info about Fayetteville Christian Church, visit www.fayettevillechristian.org.